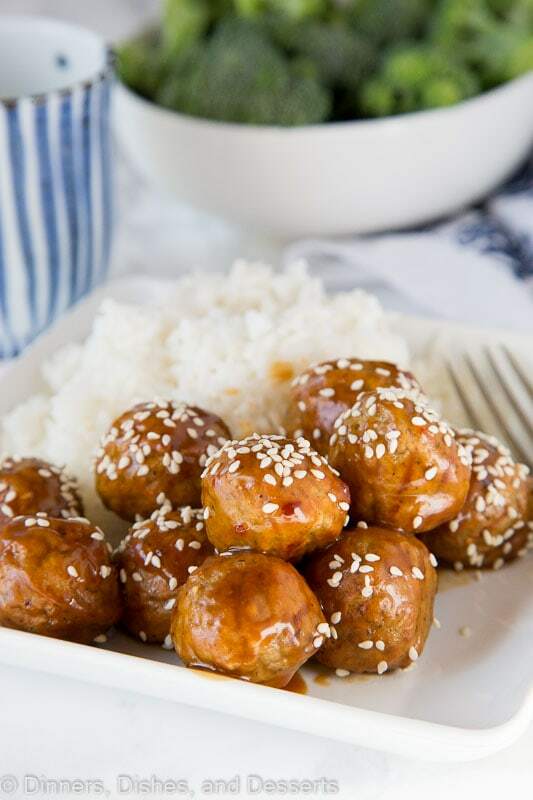 Kung Pao Chicken Meatballs – take the classic kung pao chicken stir fry and turn it into a fun meatballs dinner. 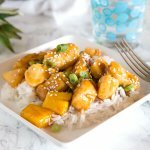 Chicken meatballs tossed with kung pao sauce and served with rice and veggies for a quick and easy dinner. Sometimes getting dinner on the table is just a lot of work, so you might pick up Chinese take out, or order pizza. Trust me, I get it. 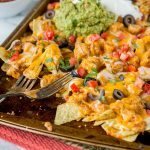 But there are healthier and tastier options that you can make in the same amount of time. I am all about getting dinner on the table in less than 30 minutes. And if I can do it in 15, even better! 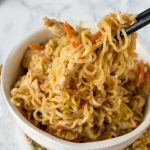 Chow Mein Noodles are ready in 15 minutes, and so much better than any take out you can get. Or Garlic Beef Noodle Bowls, which is another 15 minute dinner the whole family will love. Today we are taking classic Kung Pao Chicken and turning it into meatballs. Meatballs always make dinner more fun. 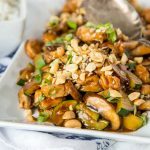 Well, kung pao chicken is a Chinese style stir fry that is often spicy. It is made with chicken, veget, peanuts, and chili peppers. Stir fries come together in just minutes, because everything is chopped small, and cooked over a high heat. This kung pao chicken meatball version is no exception! You brown the meatballs, and then just toss in the sauce to serve. 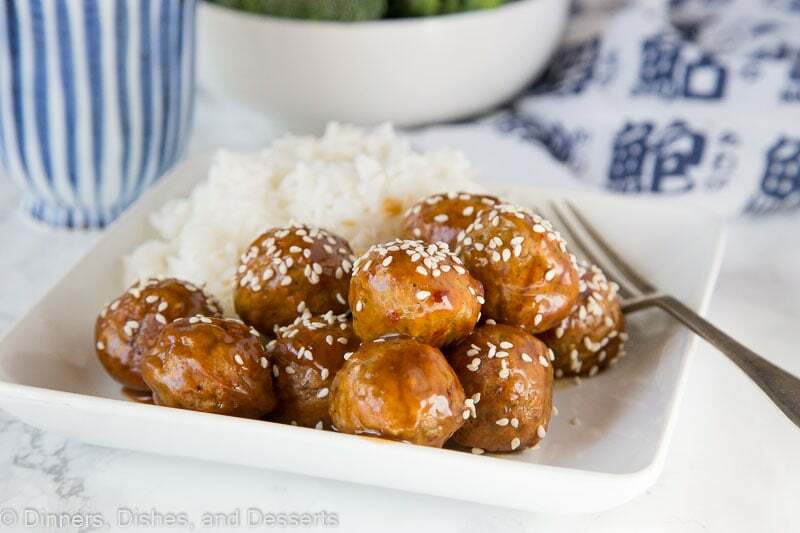 I topped them with sesame seeds instead of peanuts – but these Peanut Chicken Meatballs have plenty of peanuts on top, so you could go that route too! My family loves spicy food. My son has quite the spice tolerance, and tends to like things spicier that I do lately! 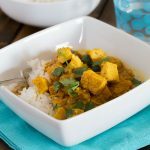 But you can definitely tame down this recipe, so even your mild spice fans will like it. Less chili garlic paste will do the trick. You could start with just a tiny bit and add to your heat level if you are concerned about the heat. If you want to take a short cut with these chicken meatballs, you can use a little help from the store. There are a few brands that sell chicken meatballs in the freezer section at the grocery store. You can pick up a relatively neutral flavored one – you don’t want Italian seasoned or anything like that. 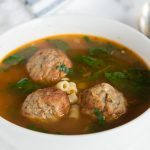 Although, Italian Chicken Meatballs are tasty! 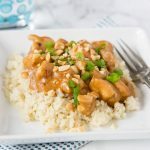 The original flavors would work great to just heat and then toss with the kung pao chicken sauce. Making chicken meatballs from scratch is actually pretty easy. These call for just a handful of ingredients. You can get the kids to help with the rolling, and then just bake to cook them through. I like to bake my chicken meatballs to cut down on the fat. Cooking them in a skillet means you need a decent amount of oil. But if that is your favorite way, than go for it! Serve your kung pao chicken meatballs with a side of rice and may be roasted or steamed vegetable on the side. 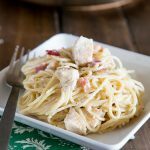 A super easy dinner the whole family will love. So much better than takeout! Love how quickly this comes together without compromising any of the flavor! 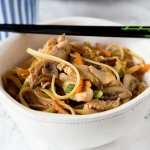 I love that you have taken one of my favorite take out dishes and made it even better! I know what is for dinner at my house! 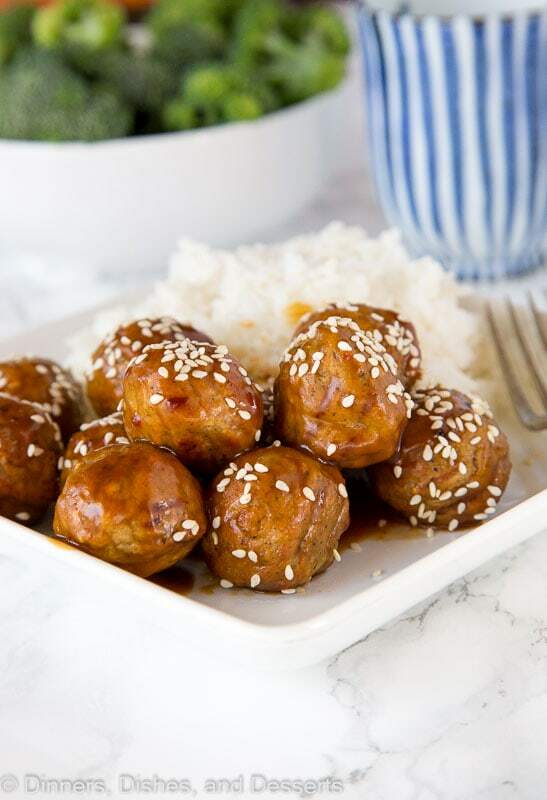 I love kung pao chicken and this meatball version sounds terrific! 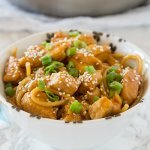 This is such a great twist on a take out classic! I love Kung Pao! 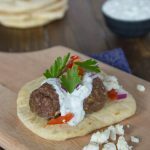 We’re big meatball fans in my house, and I can’t wait to try these! The Kung Pao flavors sound sound good — and how original for meatballs! Your chicken meatballs sound delicious. I would love to try this! 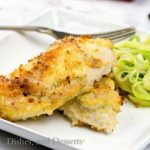 Looks perfect for parties or an easy weeknight meal!